In the fish world, big isn't always better. Even the cichlid guys will tell you this, at least, those that get let out to talk to other people. Actually, if you want quick laughs, go ask a cichlid chap to set-up a nano tank. It'll be 2ft (60cm) long minimum. I digress, I am being unkind, and actually I really quite like quite a lot of cichlids. Many catfish guys have a cichlids of one sort of another and I am happily among them. As you may now have surmised, this is going to be something of a rambling catfish of the month article, and has to do with a species that is a great choice for a good many cichlid tanks. In all truth this month's featured species is, by catfish standards, not big. At least, if all catfish were on the menu of a globally franchised coffee vendor, this species would be medium, regular, medio or some such classification. That is to say at least not grande. Relative to what my view is of the sizes of most fishkeepers fishtanks and indeed their fishes, Pterygoplichthys joelimaianus is a big fish. Unlike your average cafe latte however, you don't buy it big and it gets quickly smaller; rather the reverse. You buy it small and it gets bigger, quickly. It is also not very hot, and doesn't do well if dusted in chocolate powder. It has however, the first l-number, unsurprisingly being L001 and one that came into existence in 1988. I like originals. Working in a fish store we maintained a near mythical credit book. This was reverentially pulled forth from within shop counter and many frequent customers had their own pages. I say counter but it was actually an “I wonder where that came from” all glass cabinet that passed for both a sales desk and curio horde at the business end of the shop. It, and its contents, were all a bit Harry Potter. As the lowest rung on the staff step ladder, I wasn't ever actually allowed (or if truth be known, had any desire) to amend this book with rune like scorings that indicated that credit was given for whatever the regular customer had brought in to trade. This black tome was routinely pulled out from its slumber next to impossible air pumps of old, obscure spare parts, measuring kits made from glass and putty repair kits whenever “joe aquarist” slopped in the front door with a bucket of fish. We took in return fish and wrote up some credit for it. These negotiations could take a good few cups of horribly strong milky tea. Hot beverages again, but in a Scottish fish store in the eighties, it was always going to be tea and not coffee. Although a lot of fish species were traded in this way, it seemed in hindsight that these randomly returned or sometimes captive bred fish were typically an Oscar, a big pleco or a large amount of kribrensis younglings. The Oscar would go to into one of the small higher up tanks (next to the five or six omnipresent other ones). And it sulked there for some months until someone was so keen to own a big Oscar that they couldn't wait the six months for it to grow to this size and was happy to buy it at three times the price of a small one. It is good these fishkeepers exist; otherwise we'd be up to our armpits in Oscars and they might buy some of the cool fish we like. Meantime, the kribrensis breeder was not having an easy time understanding that the wonderful captive spawning by their kribs, and I really do mean that part sincerely, was perhaps not the first spawning of that fish in captivity. And, really, the 2cm juveniles were worth about 5p each. That they were offered for sale for £1 was” scandalous” and no heed was taken of the advice that breeding these fish was quite a common event. That conversation was one I didn't really like as often these were first time fish breeders and the fish you breed first are special, sure. Just not financially special if they're kribs. How do you get more for your kribs from a fish store? Leave the bucket, we'll get 50p for it too. That then that brings us to our return pleco. Actually, it doesn't, I would like, after attempting to return to topic, to go off on another tangent for a wee while. A great fun part of this site is the successful “What is my catfish” section of the forum. Why? Well, I see a direct parallel with the “return fish in a bucket” scenario I've just described. Actually, it's another form of armchair collecting. Sure nine out of ten online are squiggly lined Hypancistrus, Horabagrus or some Synodontis mutt, but every now and again there is a beauty. I still enthuse about the young girl from Australia that “brought in” pictures of her back garden Tandanus. Or the most excellent Madtoms folks find in bait shops. Then a Clarias from Iraq. From time to time we see some great posts in that section. Back in the real world, I remember some great cats coming in. Including the biggest Agamyxis I've ever seen — simply massive. All sorts of unusual bagrids. Some cool Synodontis and all manner of odds and bods that were great fun to identify. 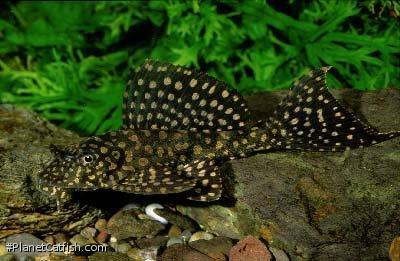 However, returning to return plecos, it was almost always some big old Pterygoplichthys. Although we never really called them that. Pleco is better to use when you're explaining to someone that although their fish is twenty times bigger than when they bought it, it is not worth anything like twenty times as much. If you're standing in line rehearsing your Italian in order to coolly order that trendy coffee, forget it. Some friendly advice; just say, “can I have your favourite coffee”, see what you get and practice your fish Latin meantime. Pterygoplichthys is one of those names that looks horribly difficult to say but isn't. Learn this and impress your fish club. Terry gop lick thees. Say again? You've got it and you've probably got a hot beverage you've never tried before. And when did medium become regular anyway? Pterygoplichthys are almost as common as globalized coffee chain stores in at least the tropical countries of the world. This isn't just those for sale in shops but where irresponsible fishkeepers have turned them lose into local waterways. They are the cockroach, pigeon or rat of the catfish world — hardy, quick to multiply and remarkably adaptable. Back in my Edinburgh fish store, we got a lot of return plecos. Unsurprisingly, these commonly were the common plecos and later some P. gibbiceps came in and indeed there were some lovely examples of those sailfinned beauties. Just near to the end of my time working in the shop, some bloke brought in a P. joselimaianus. Thought to be just another big old return pleco, it was given to me to find a tank for it “out of the way”. I was very excited to see it in the tank as it was clearly something new to me. It really was new, this was 1993 I mean this fish was L001 and that name had been invented in Germany, pre-internet, in 1988 - it certainly had not had time to become known in the UK. The fish was picked up as an odd looking common pleco and got too big. In my opinion, it must have been wild caught as I do not think that these fish were being farm bred at that time. Certainly some imports from Brazil's Rio Tocantins (one of the mighty North flowing southern tributaries of the Amazon river) were seen before even that time. Indeed, so much did the Germans like L001, that they gave it another l-number, L022. Current thinking is these are both the same species, Pterygoplichthys joselimaianus, but there was logic to the two numbers being given. L001 was for a batch of fish a little browner than the slightly blacker L022. Geographic based slight variation in base colouration it would appear to be. Nowadays they are one of the staple big plecos that sadly a lot of stores elect to sell as opposed to the much more suitable bristlenose plecos that are equally good algae eaters. That said, it is great to see naturally captive bred fish being sold and this big pleco really does look majestic. Larger individuals move around the tank floor like rifle carrying infantrymen crawling along on their bellies using their elbows for purchase. Sneaking up on an unsuspecting courgette perhaps. Once past a few inches or 8 or 10cm in length, they are not tough on plants, but larger fish will uproot all but the sturdiest of vegetation. An excellent choice for an aquarium 24” or 60cm front to back with things like pretty much any large cichlid I can think of (they are certainly hardy enough to thrive in the harder water rift cichlid tank) but have the added bonus of making a good job of eating food the cichlids miss as well as never endangering free swimming fry. I've had quite a lot of fun with “big pleco, small everything else” aquaria. Here I've put some larger plecos, sometimes two or three in with large shoals of other fishes like tetras or even rainbowfish (Melanotaenia spp.). This really works well, especially if the plecos have large area to retreat to and don't have to dive into small spaces if spooked. The plecos are no threat to the small fish and seem even to derive comfort from the natural setting. So, beware this fish if you've a regular sized tank, but it's a great looking show fish for a grande aquarium. Many larger plecos dull with age, but this fellow goes from a pretty and cute little pleco to a big old gold spotted pleco that really is quite handsome. Etymology Greek, pterygion, diminutive of pteryx = wing, fin + Greek, hoplon = weapon + Greek, ichthys = fish. Named to honour Mr. Jose Lima. Size 305mm or 12" SL. Find near, nearer or same sized spp. L001 is the same as L022. Distribution South America: Tocantins River basin. Feeding Lettuce, Peas, Frozen Spinach and any prepared food that reaches the bottom. Larger fish enjoy prawns or pieces of freshwater trout. Algae (especially soft brown) will be eaten immediately. Furniture An appropriately sized shady retreat is all this fish requires. Will not eat plants, but any individual larger then 100mm or so may inadvertently pull up plants that are not entirely established. Larger fish require heavy filtration, not because they are fussy about water quality, but because of the high volumes of waste they produce. Compatibility Larger individuals are territorial to conspecifics however not predatory and able to look after itself with all but the most violent tankmates. Not a good pleco to keep with other similarly sized plecos as the P. joselimaianus would usually win any competition for food. Suggested Tankmates Suitable with almost any fish, except other plecos due to the conspecific aggression of larger individuals and food competition. Breeding Although commercially farmed, spawning in a home aquarium would be very difficult to achieve as a large wall of mud (I.E. a river bank) is tunnelled into and used for the incubation / hatching process. Large tunnels and fish would be required in a super-size aquarium. There are 152 registered keepers, view all "my cats" data.